Last friday in Los Angeles 24 year old singer Chris Brown suffered a seizure while at a recording studio. His Publicist Nicole Perna blamed the seizure on intense fatigue and extreme emotional stress. A doctor examined the 24-year-old but he was not hospitalized. About 6% to 8% of all seizures occur because of extreme stress and sleep deprivation, rather than an underlying medical condition, such as epilepsy. Chris Brown did not suffer any major side effects from the seizure. 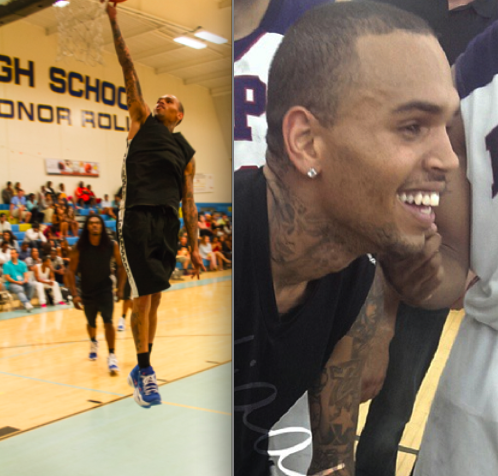 He proved he is feeling fully recovered and back to health when he played in a charity basketball game with the LAPD just two days after the incident. Not only did he play in the game, he played very well scoring a lot of points for the children of south LA. With any demanding career, a proper amount of sleep, nutrition and exercise are all critical in preventing such medical conditions like the one Brown experienced. NFL player James Ihedibo was spotted showing off his Super Bowl ring at GBK‘s Pre-ESPY’s gifting suite in Los Angeles on Tuesday. Many other athletes and celebrities were in attendance enjoying a fun-filled day of music, food and luxurious gifts. The competitive spirit was definitely in the air as attendees took their chance competing in a poker tournament to help raise money for charitable organizations. Even though former MLB player Jose Canseco says he’s great at playing Holdem’, he didn’t stand a chance up against Professional poker player Tim Phan. Tim won the tournament, beating out actor Mekhi Phifer in the last round. The cast of VH1’s new show “Hit The Floor” were reunited at the event including, leading actor McKinley Freeman who seemed to be all smiles with his gifts in hand. Jaguar’s tight end Marcedes Lewis stopped by and showed love and chatted with football Terrell Owens, and Basketball wife/reality star Laura Govan and her husband NBA player Gilbert Arena’s were seen mingling amongst the crowd. Other stars in attendance included Utah Jazz players Demarre Carroll and Trey Burke, Actor Giles Marini and many more.